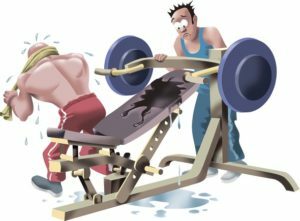 If you’re like most people who train at a gym, you’ll probably find there will be at least one thing that irks you on when dealing with proper gym etiquette. I know in some cases people just don’t know what they should be doing to be considerate of the other gym-goers. Thats why Im writing this. And for those don’t care, I guess we just ignore them and hope one day they’ll figure out the rules. This is okay to do, but there’s a couple of things to consider. If you’re using a couple of pieces of equipment, then try to have them relatively close to each other (if possible), put a water bottle or towel, or something on both pieces so others know (or should know) its being used. 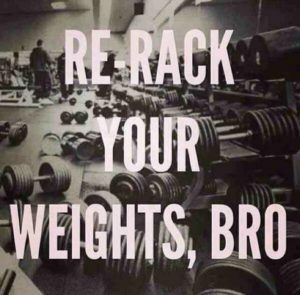 Say, if you’re doing your sets and having your break and someone wants to use the one machine; you can let them work in with you. Tell them that you’re still using it but they can work in with you. Usually they will do their set and wait until you’ve finished yours before they do their next set. They may even put the weight back to what you had it set at. This should go without saying, if you sweat it all up; then you should clean it off for the next person. Not only is there so many random germs and bacteria everywhere, but you probably wouldn’t like using a bench that had dried up sweat and dirt on it. I would love to give random tidbits of advice to people who could use it, but let’s face it, most people don’t appreciate it even if you’re wholeheartedly just trying to help someone out. Plus, I’d probably be there all day if I were to do that – (there goes my workout! lol). However, if someone asks for advice or how to set up a machine, why not help them out. We all started at the same place once upon a time. It helps to grunt when you’re trying to press a ton of weight over your head or deadlift a 1RM. Research shows it helps elicit more force and further engage the nervous system. Think Serena Williams playing tennis, there’s a reason behind it. Just don’t be a show off Shelby and grunt during your band pull-aparts warm up. If someone comes in and takes his/her stuff out a nearby locker (and clearly would be using the same bench as you), then please move your stuff to one side of the bench so you can ‘share’ the space. Don’t be a Harry the Hog; no one likes that. I hope these tips give you an idea of what is considered gym-appropriate manners when training in a public place. And if you think a friend can benefit from any of these tips, please share this with them. After all, sharing is caring.